We received a phone call from a client that had recently purchased a house on Isle of Capri, Surfers Paradise and they were in the process of doing a little renovation. This involved a little on the inside and the pool surrounds. The property had a great outlook over the main river and the owner did not want to have anything second grade. The new owner turned out to be a very well-known Australian car racing personality who knows what it takes to get a wining result, on the track or with his renovation project. The client wanted something special for this job that required a specialist team, curved glass. He was happy to hear that curved glass is one of our specialities along with the fully frameless glass pool fences that we normally do. The pool shape, like many, had a round section down one end that jutted out of the normal shape. A great aesthetic affect that could be highlighted with some curved glass added to the mix. Although when we install fully frameless glass pool fencing we always believe in measuring twice, when it comes to curved glass we don’t mind admitting that we like to measure more than twice. Sometimes 5 or 6 or even 7 times. As the wait time can sometimes be over 2 months for the production for the custom glass curved panels it is more important than ever that we get it right. We were able to install all the straight panels on this job first and come back to install the curved glass when it arrived from the production factory. Needless to say the curved glass arrived and we installed it without a problem. The effect it has on the whole pool area was outstanding and the client could not be happier. 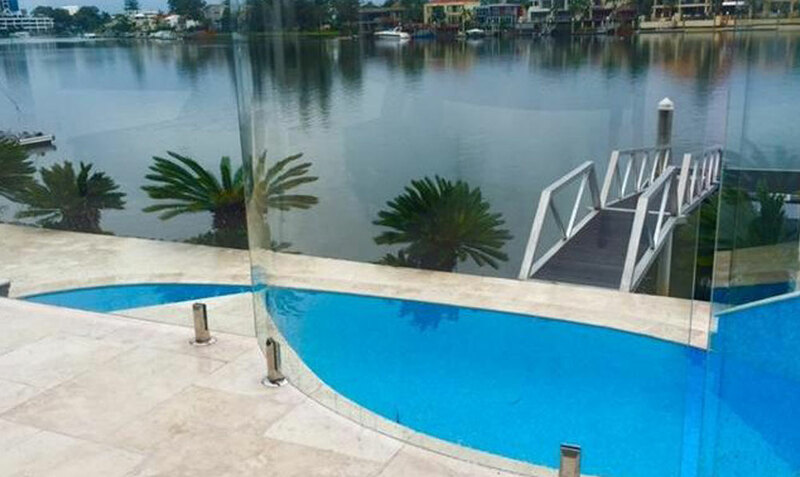 We have to admit we also love integrating curved glass in to our fully frameless glass pool fence systems, it has to be seen to be believed. Once again another happy Absolut Custom Glass System on the Isle of Capri, Surfers Paradise, Gold Coast.